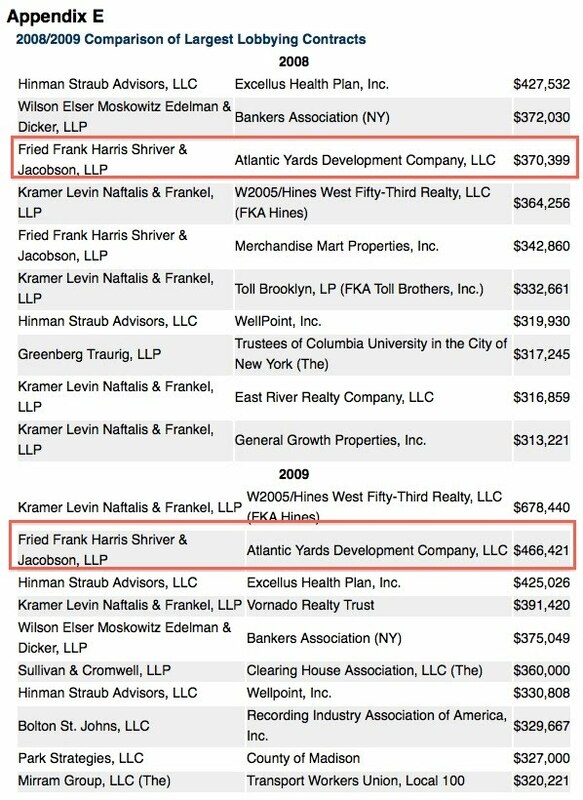 Developer Forest City Ratner spent $1,127,598 in 2009 on city and state lobbying, just outside the top ten spenders in the state and perhaps the largest sum for any real estate developer. 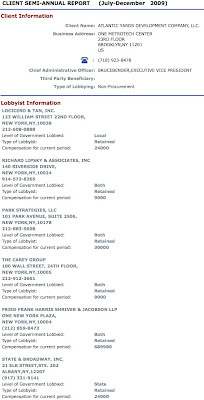 Forest City Ratner's spending, almost exclusively through the Atlantic Yards Development Co., includes what the New York State Commission on Public Integrity calls the second-largest lobbying contract in the state, $466,421 with the law firm Fried Frank. 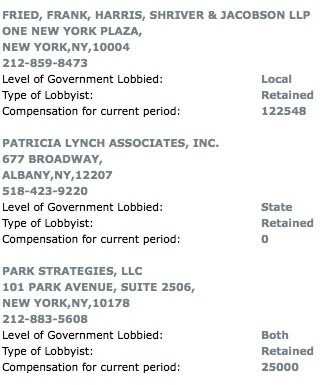 However, my analysis of the underlying data (screenshots at left, below) shows that AYDC actually paid $812,528 to Fried Frank for lobbying, with nearly $690,000 in the second half of the year. 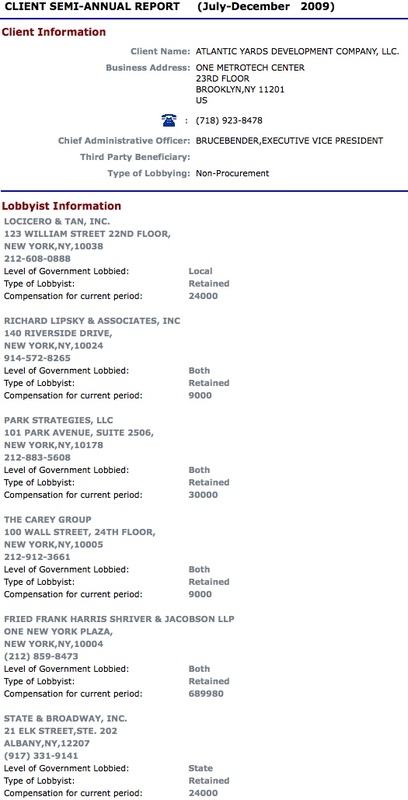 The main news from the Commission's annual report, according to the official press release and coverage in the New York Times and Albany Times-Union, is that spending on lobbying decreased for the first time in nine years. That wasn't the case, of course, for Atlantic Yards. A New York Daily News article, not online, is headlined "Lobby dough slows in Albany - a pinch." It contains an obligatory quote from Susan Lerner of Common Cause/New York: "Even with this small drop last year, this kind of pile-on really reinforces the public sense that there's no one in Albany listening to the average New Yorker. That is not a good situation." Why so much in the second half of the year? Some of the heaviest lifting came in the late spring, when Forest City Ratner managed to get the Metropolitan Transportation Authority (MTA) to revise the Vanderbilt Yard deal and to get the Empire State Development Corporation (ESDC) to issue a revised Modified General Project Plan (MGPP). So it's possible some of the second-half payments went to earlier work. Or maybe they had more to do with the ESDC's September 2009 passage of the MGPP or the December 2009 "arm's length" negotiation of the Development Agreement. 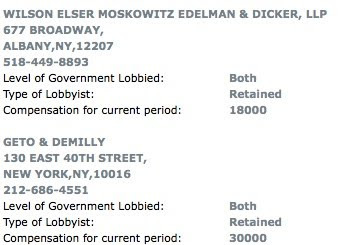 According to state lob by data, Fried Frank lobbied both the MTA and the ESDC, as well as the New York City Economic Development Corporation, the New York City Law Department, and the New York City Transit Authority. In 2008, FCR spent $928,652 on city and state lobbying, with at least 80% of it devoted to Atlantic Yards. This year, with more contracts to (re)negotiate, the spending ramped up considerably. This year's total of $1,127,598 includes $1,089,528 spent by the Atlantic Yards Development Co. and $38,070 spent by Forest City Ratner. That was nowhere near the $3.6 million spent by the United Teachers, the biggest spender. The others in the top ten spenders were mainly public employee unions and healthcare organizations. No real estate developer was in the top ten. Wegmans Food Markets spent $1.24 million to snag the tenth spot. 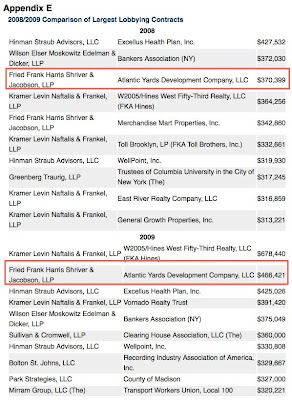 Forest City Ratner's spending of $1.13 million put it barely outside the top ten.